Sophisticated Elegance, Cutting Edge Design & Trusted Technology... The Perfect Combination! The display panel is the driving force of the Touchsafe Pro system. It alerts staff to the calls made from any call point or assistive device within your complex and directs help to the exact call location, while arming your staff with the necessary information to deal with the call effectively. The Touchsafe Pro Call Point provides the means to put a call onto the system from various locations within your complex. The Call Points are battery powered and communicate via radio with the display panel(s). Activate a call from a hand held device. Raises an alarm through the nurse call system when the monitored door is open. A convenient device for users who wish to remain as mobile as possible. Used above a door to highlight the location (room or bed), the type of call and where the call has been made from. Battery replacement warnings, tamper alarms and regular polling of radio devices automatically keeps the system functioning properly all of the time. Multiple battery backup options are available to ensure the panel is safe even when the power fails. The Touchsafe Pro Display Panel is available in 15” as standard. However, we also supply a 10” version for areas in which space is restricted. Being wireless, The Touchsafe Pro provides quick, undisruptive installation and flexibility into the future. New horizontal orientation allows the Call Point to attach to bed head trunking with ease. Alternatively, the Call Point can attach to the wall using just a bracket and two screws. The mounting bracket includes a quick release switch which allows the user to remove the Call Point easily. Two-way communication software acknowledges that the call has been received by the display panel with audio and visual indicators to reassure the user that help is on its way. Once a call is cancelled our ‘Next Call Waiting’ feature informs staff of the next priority call in their area. This improves response times and prevents unnecessary journeys to the main display panel. Optional pear push leads provide a means to activate a call from a handheld device and simply plugs into the bottom of the Call Point. These can be stored in a cradle or secured to bed sheets using a linen clip. Numerous other accessories and telecare devices can be connected to the Call Point to customise the system to specific patient needs. Our Call Points are available in a number of configurations including integrated emergency or cardiac pull stops, standard emergency call pushbutton and they can be configured with or without LCD screens. All Touchsafe Pro Call Points are embedded with an antimicrobial agent that prevents the growth of harmful micro-organisms. 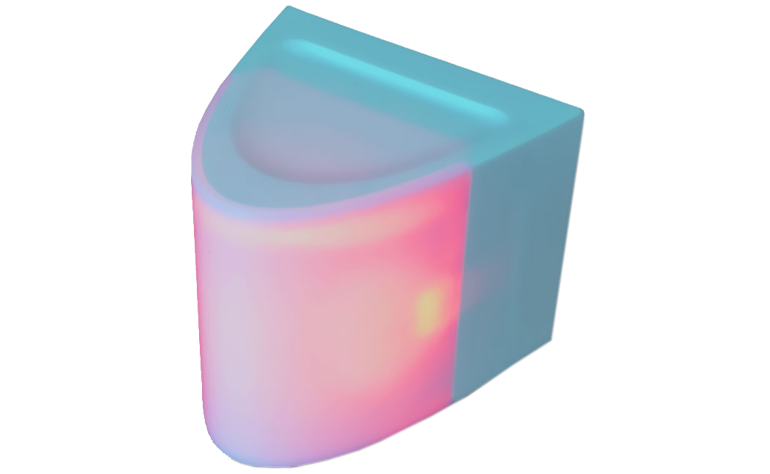 This protects users from the spread of germs and disease. Battery replacement warnings, tamper alarms and regular radio communication automatically keeps the system functioning properly all of the time. 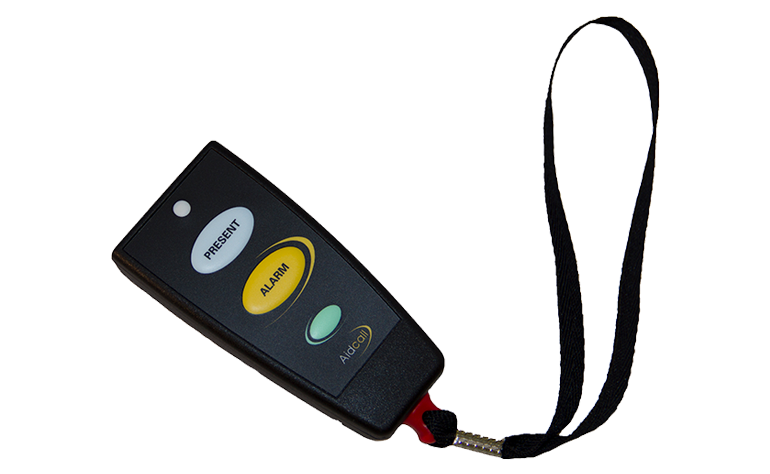 The ‘buddy’ is a portable, remote, infra-red transmitter trigger. 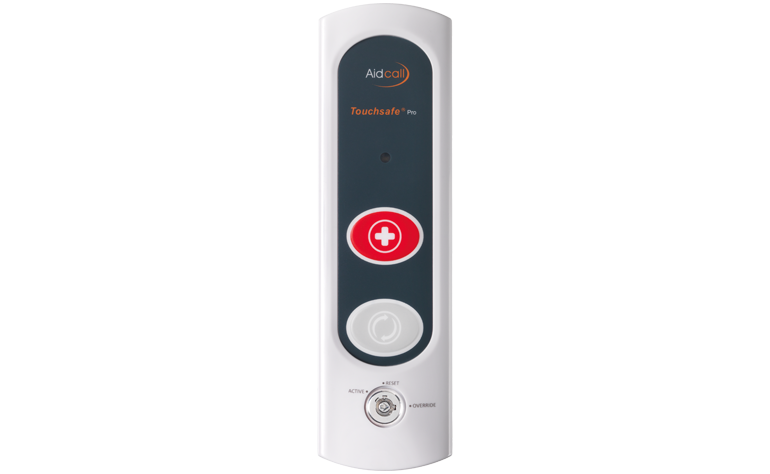 Combining the functionality of the staff attack alarm and nurse presence identification, this ‘buddy’ allows you to track staff locations as well ensuring their safety which is paramount in the healthcare industry. The staff attack function is compatible with the ATX3000/3000+/4000 and ATX5000 call points. The nurse presence identification feature provides a permanent record of the nurse in attendance. This facility allows you to track and monitor individual staff activity i.e. which member of staff is answering which call and when. This helps to provide greater clarity and accountability in care home management. When combined with Aid Call’s Call Logging system, care managers are able to analyse response and attendance times at client and nurse level and help improve overall resource efficiency. 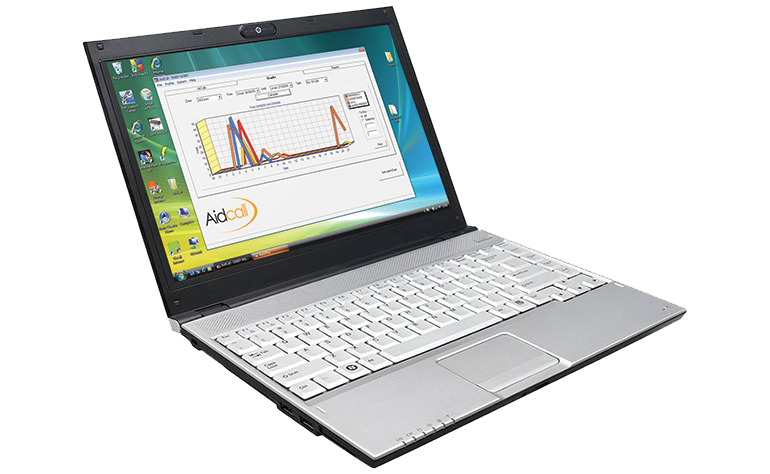 The Aid Call "Call Logger" software can be installed on your PC enabling you to download, manipulate and analyse call data from the CP3400 and CP5000. The software provides reassurance to the users' and clients' families and also acts as a management tool to log and report whatever happens to the system, including power failure. 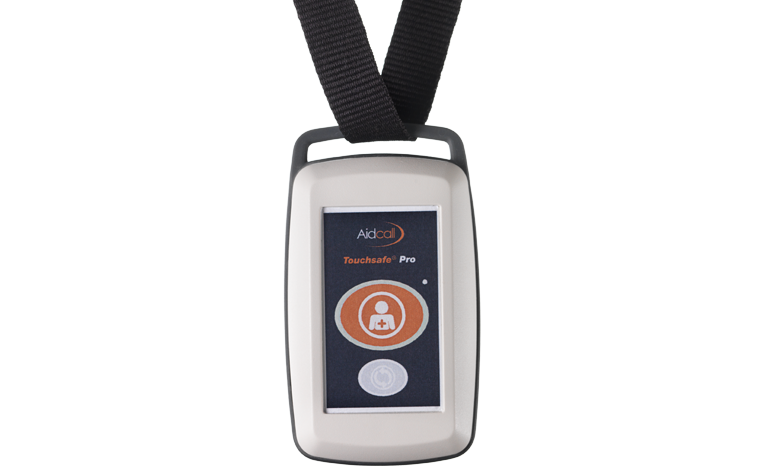 For patients with mobility issues, and for added convenience, Aid Call Pear Push leads are a means to activate a call from a hand held device. These leads can be rested on the bed of a patient to minimise the required movement needed to make a call or stored in a cradle connected to the nurse call point. A cable-break version is also available for added safety and ease of movement. They are all completely waterproof, glow in the dark for ease of use during the night and can be attached to the bed sheets using an optional linen clip. An LED illuminates alongside a short beep when a call has been made so the patient knows their call has been registered. An additional Pear Push Lead is available with an incorporated light switch allowing for the switching of existing bed head lighting. Once activated, the Door Status Monitor will raise an alarm through the nurse call system when the monitored door is open. This call can only be cancelled by visiting the door and resetting the unit with a key. This key can also disarm the door during periods in which it needs to be used. The system can also show which doors are currently armed and those that are disarmed. 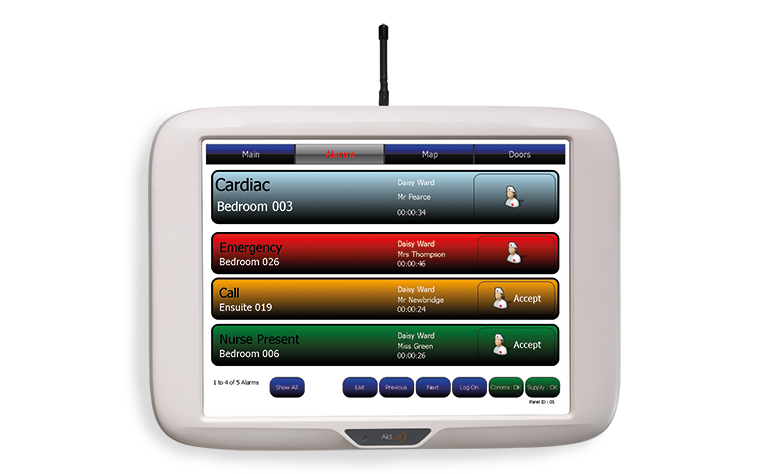 The door status monitor includes an emergency call button to raise an alarm manually on the nurse call system at any time. This must also be reset with a key. For use with The Touchsafe Pro system, the Door Status Monitor has been designed to fit neatly and discreetly against any door. Battery replacement warnings and regular radio communication automatically keeps the system functioning properly at all times. 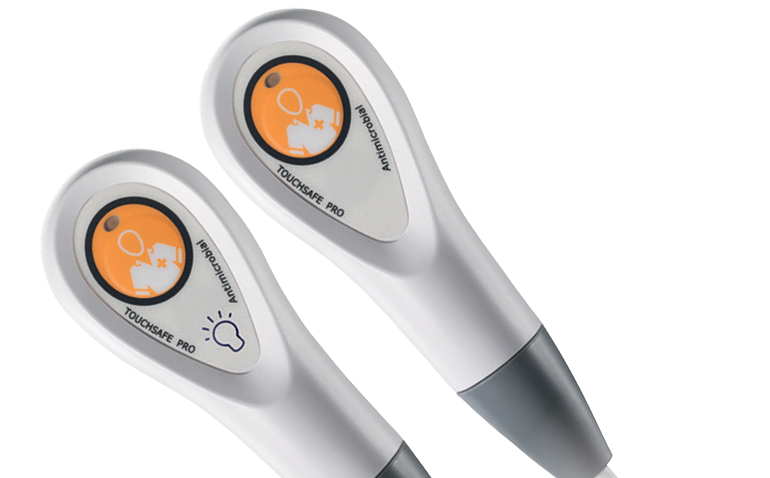 The Touchsafe Pro Pendant provides the means to raise a call through the main nurse call system from a neck-worn, portable unit. It is battery powered and communicates via two-way radio transmissions to ensure all calls are transmitted and received correctly. A red reassurance light will flash when a call is made to ensure the user knows it has been acknowledged by the system. The pendant includes a large orange call button and a smaller light grey cancel button. 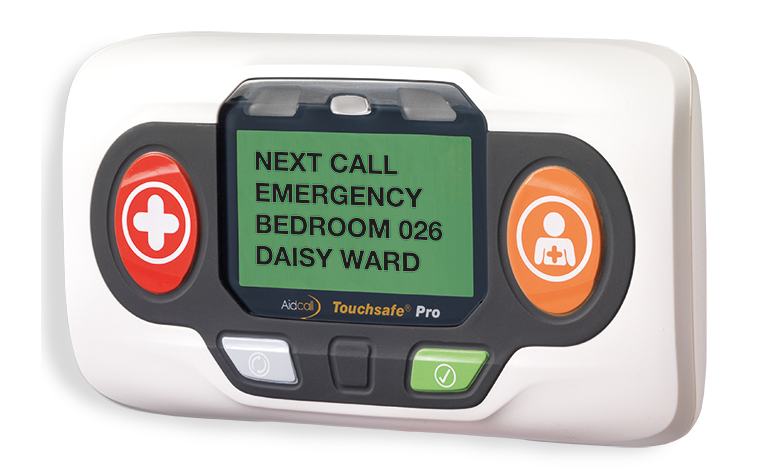 It can be programmed to raise a normal nurse call, an assistance call, or an emergency call when the orange button is pressed. The call can only be cancelled by pressing the cancel button on the pendant itself. It is supplied with a 900mm long woven neck lanyard with anti-ligature safety closure. Should excessive pressure be applied the lanyard will part – it can simply be clipped back together. When the battery is low it will raise an alert through the main system and indicate the exact unit that needs attention. Our AVI3000 Audio Visual Indicator has now been replaced by a new model that offers improved aesthetics, better light distribution making it easier to see, and an enhanced internal sounder. It is used above a door to highlight the location (room or bed), the type of call and where the call has been made from on the system and/or can be used as ‘follow me’ lights (commonly used in hospitals).